Ask fellow campers about "Sonoma Coast State Beach Bodega Dunes" and nearby attractions. We were looking for a CG on or near the coast with cell service so we could escape the heat of the Central Valley and catch up on news, correspondence, blogs, etc. We're self contained and don't use the facilities. We stayed on week nights in mid-September in our 25 foot MH. This is a pleasant CG nestled in the sand dunes and near the Pacific. We arrived at noon and found about half the sites were available and they were mostly filled by evening. There are 3 loops, 1 upper and 2 lower - we stayed in the lower which is closer to the dunes. The sites are mostly good sized, with those on the outer perimeter slightly larger. Most had paved, sand covered pads. There was a mix of sun and shade, some were more private than others. Most needed some leveling. All sites are primitive with water available at several spigots. There's a dump station near the entrance. There's no wifi. There's good ATT and Verizon coverage. The CG is clean and well maintained. The host was helpful and friendly. We camped at Sonoma Coast State Beach Bodega Dunes in a Motorhome. There are several social trails from the CG leading to a trail network throughout the dunes and to the beach. There's also a paved road to South Salmon Creek Beach. Although the beach is walkable, signs suggest no swimming due to hazards. The CG is 1.5 miles to the town of Bodega Bay, although there's no sidewalk and the road is narrow. There are a few gift shops and a convenience store in town. When you reserve a site it is non-site specific. That means if you have a trailer, plan to arrive early. Otherwise you might not get a site you can fit into. The site says that they are 31 feet long, but almost none of them are that long. We we arrived there were 8 sites left and we could only fit into one with our medium length trailer. The sites are shady but that's all you get for your fee. We camped at Sonoma Coast State Beach Bodega Dunes in a Fifth Wheel. This campground has nice spacing between sites with lots of shady spots and a few sunny ones. Most sites were suitable for a trailer. There are no hookups but there are flush toilets and hot coin operated showers (although we didn't use the showers). There is a dump station. We got good Verizon reception. We camped at Sonoma Coast State Beach Bodega Dunes in a Travel Trailer. There are hiking trails from the campground that go to the bay and the beach and over the dunes which are extensive, as well as many other trails along the coast within Sonoma Coast State Beach. You could hike for days and enjoy beaches, gulches, and bluffs. There is the town of Bodega Bay within a mile with shops and restaurants, and the town of Bodega is a few miles away where "The Birds" was filmed. We wanted to come to Bodega Bay for a few nights and this was the only reservation we could get on a Sunday in August. You reserve a spot with Reserve America and when you drive in the ranger asks you to drive around and pick out 3-4 sites and then come back and let them know which one you want. We arrived between noon-12:30 and they were letting all of us check in early. We found several that would work well with our 24 foot RV. Most sites have a fair amount of trees around. We tried hiking to the beach access but it was probably a mile and a half from our campsite so we just drove over. The beach is spectacular. You can walk for miles. We had no AT&T data but our Verizon data had 2 bars. No TV. Pretty protected from the wind and a nice amount of space between your neighbors. We camped at Sonoma Coast State Beach Bodega Dunes in a Motorhome. We love this park. No electricity or hook ups for motorhomes, and you need a mat to keep the dirt out, but you can hike to the beach, go through the fence to get to the harbor, bike and generally relax. The state is so poor than they close 90% of it for the winter - proving yet again they are idiots. 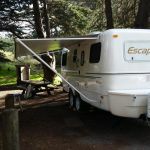 Camp hosts are nice and rangers OK. We camped at Sonoma Coast State Beach Bodega Dunes in a Motorhome. This park rating is based on location. The sites have not changed one bit over the last 30 years. They finally fixed the beach access. State employees were less than friendly, camp hosts were great. Rules are not enforced here but for the most part very family friendly. Big sites easy in and out. Protected from the wind unlike Doran. Dry camping here only which is very nice, great for tents of motorhomes. Restrooms and showers are average, but again I am sure this is a staffing issue that has not ever changed budget or no budget. Great for the kids, safe to ride bikes, great hiking or horseback riding in the dunes. Don't forget a short drive into Guerneville and Johnson's Beach on the Russian River. Park for free, still two dollar burgers and one dollar ice cream. Rent a canoe or just hang out. Highly recommend this one for kids. Clean and well managed by the same family for many years. Too bad the State of California park system fails as always to compare to other states! Not to discourage, pack up and go you will not be sorry. We camped at Sonoma Coast State Beach Bodega Dunes in a Travel Trailer. No hook ups; showers too expensive and cold, but clean. Super beach. Who cares about hook ups, when you get a paradise beach. They could fix the street, so you don't get shaken up on the way to your site. We camped at Sonoma Coast State Beach Bodega Dunes in a Motorhome. We always stay in the sites toward the middle that are protected by the trees. You don't have to worry about the wind. Great campground that's close to town. We camped at Sonoma Coast State Beach Bodega Dunes in a Fifth Wheel. Beautiful sites--spaced far apart, lots of trees. Every site has a picnic table, fire pit, and storage cupboard. All are close to trash, recycling (yay! ), and fresh water pump, as well as nice, clean bathrooms with hot showers. We stayed off-season, so park was practically deserted. Gorgeous flora (and scary fauna--skunks are about, so beware!). Loved walking the area, but dogs are not allowed on dunes, which you have to cross to get to the beach. If you have a dog, you'll need to drive north to find a beach where Fido is welcome. But we found plenty of roads to walk with our dog. Lovely spot. We camped at Sonoma Coast State Beach Bodega Dunes in a Motorhome. Are you affiliated with Sonoma Coast State Beach Bodega Dunes ?